Gene Simmons, Lars Ulrich, Brian May et al. DVD: 134 min., Blu-ray: 134 min. Ritchie Blackmore is beyond doubt one of the all-time great guitar players. From his pop roots with 'The Outlaws' and his many session recordings in the sixties, through defining hard rock with 'Deep Purple' and 'Rainbow' in the seventies and eighties and on to the renaissance rock of Blackmore's Night, Ritchie has proved that he is a master of the guitar across a multitude of styles. 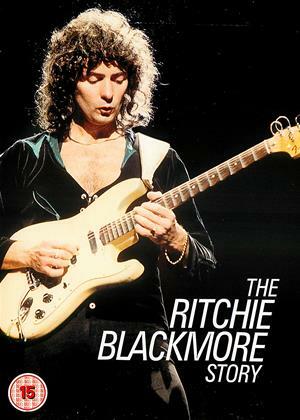 For the first time 'The Ritchie Blackmore Story' tells the story of his remarkable career through extensive specially recorded new interviews with Ritchie himself plus contributions from many of his colleagues and admirers including: Brian May, Glenn Hughes, Lars Ulrich, Steve Lukather, Joe Satriani, the late Jon Lord, David Coverdale, Gene Simmons, Joe Lynn Turner, Steve Vai, Graham Bonnet and Ian Anderson. This is the definitive story of a true guitar legend.